Theo Spark: United Nations – Are Brexit Voting Brits More Racist Than Ever?............from Dan T.
United Nations – Are Brexit Voting Brits More Racist Than Ever?............from Dan T.
Why civilised nations continue to give credibility, along with billions of taxpayer dollars, to an organisation that is flawed beyond repair and openly hostile to civilised nations defies logic. The United Nations has been taken over by an organised collection of third world dictators, communists, anti-Semites and anti-development globalists who harbour a hatred for the United States, Great Britain and Israel. The latest imbecility emanating from this epicentre of globalist world government is to send a special envoy to Great Britain to report on racism, discrimination and exclusion since the British people voted to regain their independence and sovereignty from the corrupt European Union (EU). 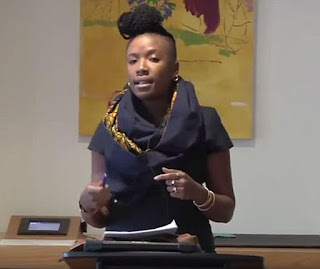 Zambian-born, Zimbabwe raised American academic, Tendayi Achiume, the UN special rapporteur on contemporary forms of racism, racial discrimination, xenophobia and related intolerance follows on heels of other bureaucrats sent to Great Britain to denigrate and insult its people. Civilized nations continue to giver credibility along with billions of tax dollars to the UN because those nations are run by Davos and the Bilderbergs. All major political parties in every Western nation are run by the One World Government crowd. And the UN is the current best example of One World Government, so it MUST be funded and supported. Same for the EU. THAT is why they screech and wail so hard against Trump and Duda and Orban and Putin. Anyone who dares stand for independent sovereign nations, and who thinks Western culture is worth saving, must be destroyed.